Saturday, May 5, 2018, 5:00 p.m. – 6:00 p.m.
We keep one composer and swap out two from last month’s American Romantics program on this month's installment of Discoveries from the Fleisher Collection. The two new composers are also two Arthurs—Bird and Foote—and we’ll hear music they first wrote for other purposes. Arthur Foote’s Theme and Variations was originally a movement in his Suite in E major for String Orchestra, a work we’ve heard previously on Discoveries. Orchestral audiences, if they’ve heard any Arthur Foote at all, will probably have heard this Suite, as it is still performed, and rightly so, for it exhibits the wealth of gifts this composer shows in all his music. The grand sweep as well as the nuanced detail are there, in his choral and organ music, in his chamber music, in the Suite, and here in Theme and Variations. It was replaced in the Suite by a Pizzicato and Adagietto, so now this espressivo theme and six variations stand on their own. The chamber-sized Gowanus Arts Ensemble, conducted by Reuben Blundell, makes this premiere recording sing with an intimate intensity. Blundell also directs New York’s Riverside Orchestra and the Lansdowne Symphony Orchestra, just outside Philadelphia. His researching and recording of these American Romantics, in collaboration with Curator Gary Galván and Assistant Curator Stu Serio at the Fleisher Collection, is a boon to a deeper understanding of this country’s music. Foote is listed in the so-called Boston Six or Second New England School with George Whitefield Chadwick, although differs importantly in that he did not travel to Germany for any of his schooling. A Harvard graduate, he also helped found the American Guild of Organists. He wrote textbooks on harmony and piano performance, and edited the Unitarian hymnal of 1890. Arthur Bird, a New Englander of the same generation as Foote and Chadwick, nevertheless doesn’t make the list of The School (Beach, MacDowell, Paine, and Parker are the others) for two probable reasons: his output and influence were not as great, and he spent most of his career, in fact, in Germany. Nevertheless, he did compose a good bit of worthy music, much of it for winds. He composed his Gavotte for piano in 1884, and then made good use of it by orchestrating it for strings in 1885, and for other chamber ensembles in 1886. His efficiency extends to the Valse menuett. The piano manufacturing company Mason & Hamlin began as a builder of organs—small reed organs for the home called organ harmoniums. 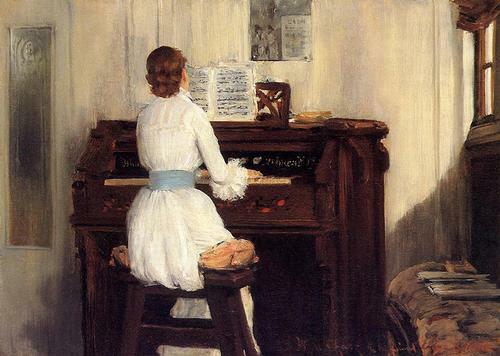 To help popularize the harmonium, they commissioned composers to write music for it; Arthur Bird was one, and the Valse menuett came to life in Three Pieces for Normal Harmonium in 1898. He made the string orchestra version right away. With Chadwick’s powerful Symphony No. 3 adding to his reputation as an outstanding American composer, his music, along with Arthur Bird’s and Arthur Foote’s, reveals Romanticism spreading into the new landscape of the American Twentieth Century. Listen to Discoveries from the Fleisher Collection the first Saturday of each month from 5:00 p.m. to 6:00 p.m. on WRTI 90.1 FM Philadelphia, 97.7 Reading, 97.1 Allentown, WJAZ 91.7 Harrisburg, 90.7 York, WRTL 90.7 Lancaster Ephrata Lebanon, WRTY 91.1 Mount Pocono, 94.9 Wilkes-Barre, 99.1 Pottsville, 106.1 Scranton, WRTQ 91.3 Ocean City, WRTX 91.7 Dover, and on the web at www.wrti.org. Hosted by Kile Smith, former Curator of the Fleisher Collection, and Jack Moore, Program Director of WRTI. Encore presentations of the entire Discoveries series can be heard every Wednesday at 7:00 p.m. on WRTI-HD2 and you can explore the archives of the radio program essays dating back to 2002.